Lucila came over to talk to us about Natasha’s bautizo tomorrow. We’re supposed to be at the church at 9:00 a.m., after the singing. The service will last another hour. We’ll sit in the front, but will not have any part to play in the actual baptism, such as presenting the child. Of course, Marilyn will take pictures. Margoth and Victoria will be coming with us. At almuerzo, Isabel said that Brayan wouldn’t be coming. He has a program at school (or church?) to attend. Isabel is working. We’re allowed to bring up to eleven people. Padrinos (us in this case) usually bring family members. 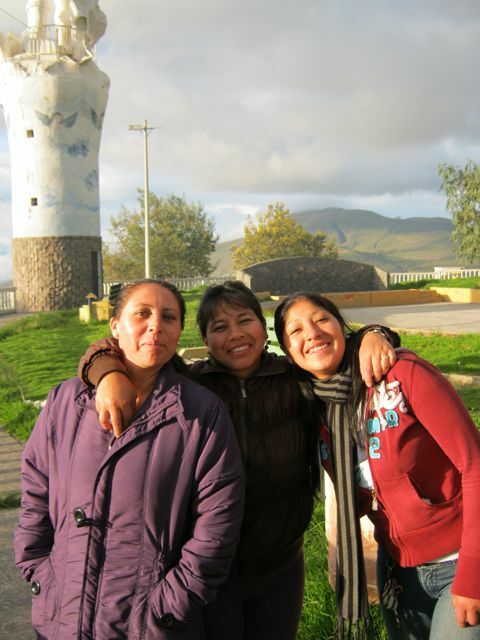 These friends and a few others, here and in Quito, are the closest to family members we have in Ecuador. 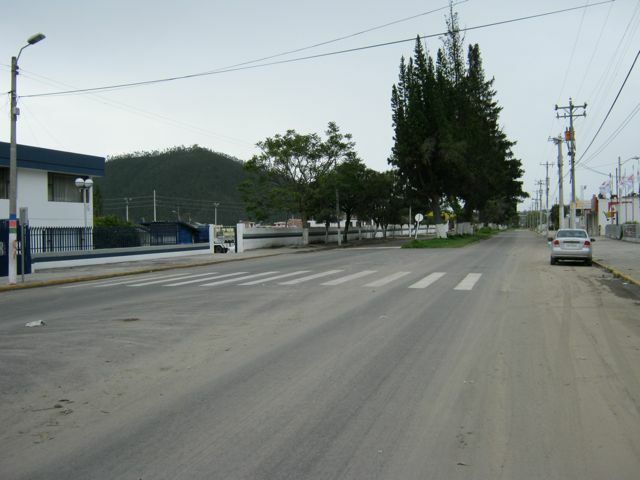 Lucila also told us that the teachers at Caluquí haven’t been paid in three months. The Fourth of July Foundation, who pays them, has stopped receiving money from the government. I don’t know why the government gives money to a foundation to give to a pre-school instead of giving it directly to the pre-school, but that’s apparently how it works here. Maybe what they call foundations here are what we would call government agencies in the U.S. The pre-school workers applied to have their salaries paid by another foundation. The change is supposed to take place in January. Meanwhile, I doubt they’ll ever see any of that back pay. While Lucila was talking, I figured there was a reason she was telling us this. She was probably hoping we’d contribute something. I started thinking and remembered that we had $100 budgeted for whatever churches we attended this month. We’ll probably only go to one, possibly two, church services. Why not give each of the three maestras (teachers), plus the cocinera (cook), $20 each, especially during the Christmas season? We’d still have $20 for church this month. When we got back to our habitación (room) after almuerzo (lunch), Lucila asked for a loan of treinta (thirty) dollars. Marilyn looked at me for guidance and I said yes. I was thinking, “That’s the exact amount that I was going to give.” When Marilyn got the money I told Lucila it was a gift, not a loan, because I was thinking that we’d be giving the same amount to the others at the pre-escholar. Of course, we got great big hugs and thanks. After Lucila left I told Marilyn of my plan. She reminded me that treinta meant thirty, not twenty. I’m usually better than Marilyn with numbers in Spanish, but I often think twenty when I hear treinta, probably because the words sound similar. Oh, well, we blew that part of the budget this month because of my mistake. I’m attempting to be vigilant about not trying to fix every need I see, especially with money. I’m aware that that can lead to despair and frustration on the part of the donor and a certain amount of dependence on the part of the recipient. But, really, when $120 will brighten the lives of four people with whom you have a relationship, as well as their families, for the next month, how can you say no? After all, ‘tis the season: the season that reminds us of how good the whole year can be. May all of our friends and relatives have a Merry Christmas and a Blessed New Year. Display at the house of someone we know. FEDICE sponsored a Christmas program for parents on Saturday, December 11th at the pre-escolar in Caluquí. 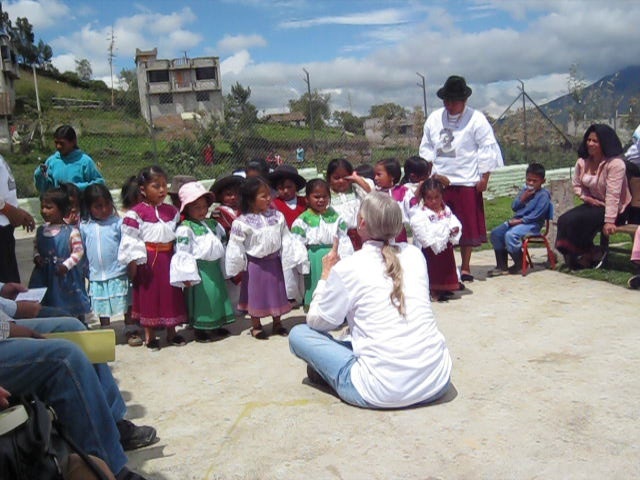 My students rehearsed for a week as I had only heard about the program the Saturday before, when Blanca asked if the children could sing a couple of songs in English for their parents and siblings. They were also going to perform some traditional dances and some songs in Spanish that their other teachers were working on. I have never pressured the children. Listening to English words and very short sentences, and learning what the words mean have been as much a focus as has been saying the words. Would they be ready in time? 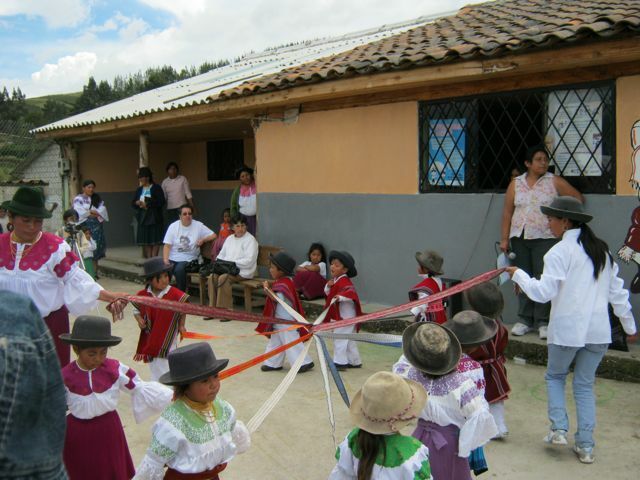 Children doing a traditional dance. The children have been singing this song twice a week since September. Mary had a baby, Oh Lord. Mary had a baby, Oh my Lord. As it turned out, I had to cut the other two verses on the extra rehearsal we had on Friday. There were just too few of us singing. 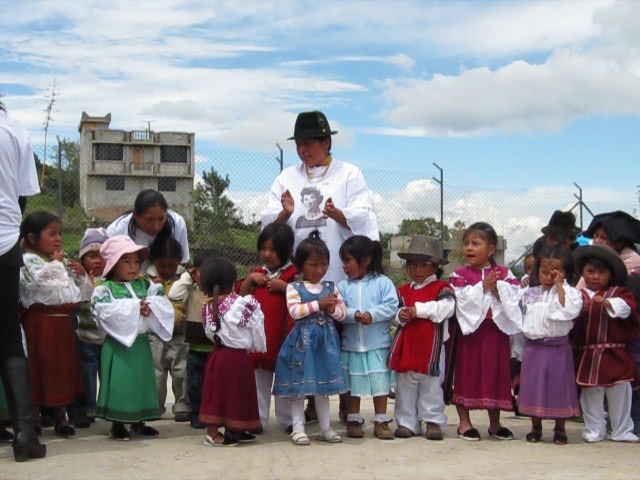 The older children are used to the occasional performance of traditional dance that they have learned. Performing in English was new, but they did not seem to get the butterflies that older children and adults often have. Of course, they can become totally silent when facing an audience. So, how did they do? The good morning song was great. I think I sang solo on the fruit chant. The children that sang well were given the extra responsibility of holding up a fruit or picture when the fruit was said. This seemed to be too much to do: to sing AND to hold up a fruit. They’ll learn multi-tasking in the future. And the Christmas song went well. Whew! The parents seemed pleased enough. So I have to say, the performance was a great tool to help them learn better and my butterflies are now a thing of the past. Wednesday, as we were getting into the car to take Rosa, Margoth, and Elvia on an excursión, Paulina came running out with a bag that had the names of everyone in our little community at the hotel. We were supposed to draw a name and become a Secret Pal (or Amigo Secreto) to that person. 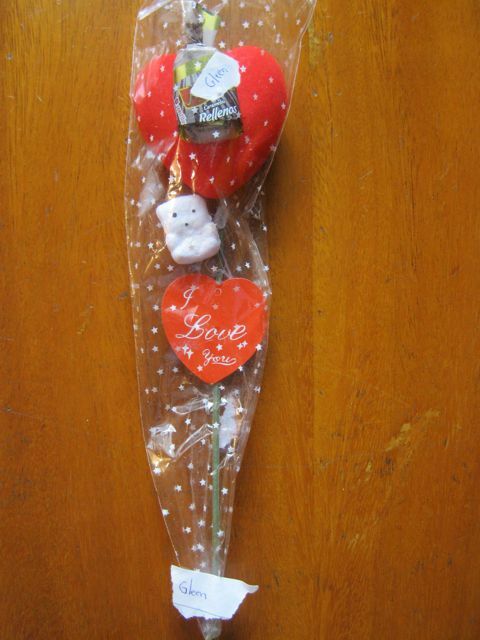 Each day one gives her or his Amigo Secreto a small gift surreptitiously, usually a golosina (piece of candy or gum). I guess this lasts until Christmas (Navidad). I’m not going to divulge the names we drew, just in case this blog entry gets back to them. Thursday was the first day of Amigo Secreto and Marilyn found pieces of candy for each of us when she went into the kitchen during breakfast. We hadn’t had time to get anything for the people whose names we drew, so Marilyn went out after her class and got an assortment. We put a candy for each of our “charges” in the designated caja (box) in the afternoon. Each gift put in the caja has the name of the recipient. Each of our Amigos Secretos struck again Thursday evening. I got a couple of peanut butter cracker sandwiches and Marilyn got a piece of candy. We also put our gifts in the caja that night for the next day. Today is Saturday and I was disappointed to find that there was no golosina for me this morning. I did not receive one yesterday, either, but I understood that because I had received two the day before. Has my Amigo Secreto fallen down on the job? It is pretty interesting how quickly I’ve become a perro de Pavlov (Pavlov's dog)! My Amigo Secreto really made up for yesterday. We found a beautiful regalo (gift) for me in the caja this morning. I’m loved after all! We hardly ever give anybody any trouble – at least not intentionally. I’m almost 62 years old, for Pete’s sake, and Marilyn is not far behind me. We know what it's like to deal with people who are not behaving. But every now and then… I get a little devilish. And I want company. What’s that they say about there being safety in numbers? While we were eating almuerzo (lunch) today, Isabel told us we’d be having helado (ice cream) for dessert. We finished lunch and waited. We waited some more. The staff was eating lunch in the kitchen. We got tired of waiting. A flash of inspiration as to how to remedy the situation came to me, and Marilyn was willing to be bad with me. Since we were the only ones in the dining room, we started banging on the table and chanting, “¡Hel-la-do!, ¡Hel-la-do!, ¡Hel-la-do!” There was laughter in the kitchen, and soon Isabel came scurrying out with our helados. Sometimes, it’s good to be the kid. This morning Pablo was at breakfast again. He’s been very interesting to talk to. He primarily speaks Spanish, but we understand a lot of what he says and he understands us pretty well. He’s very knowledgeable about history, culture, and agriculture. Pablo works on agricultural projects all over Ecuador. He’s been working on a project in this region to teach farmers how to grow organic crops. As in the U.S., many crops are grown in Ecuador with the aid of fertilizers. As is also the case in the U.S., farmers can make more money on organic produce. Receiving better prices for their produce, of course, helps raise their standards of living. We first met Pablo some months ago. Since then, we’ve seen him about every month, usually at breakfast. From the first time, we invited him to sit with us. He just looked interesting. He stays at this hotel when he’s working around here. We know he’s also responsible for projects south of Quito and near the coast. Pablo is a fairly slight young man, soft-spoken, and good looking. When we first met, we were pleased to learn he spoke some English. It facilitated our conversations. Our Spanish now isn’t that great, but it was a lot worse when we first met him. Today we hardly used any English at all. He doesn’t speak slowly, but neither does he speak so rapidly that we have no hope of understanding. Through Pablo, we’ve learned a little more about the customs, history, climate, and crops of Ecuador. He’s told us which fruit trees grow well around Otavalo, and which do not. 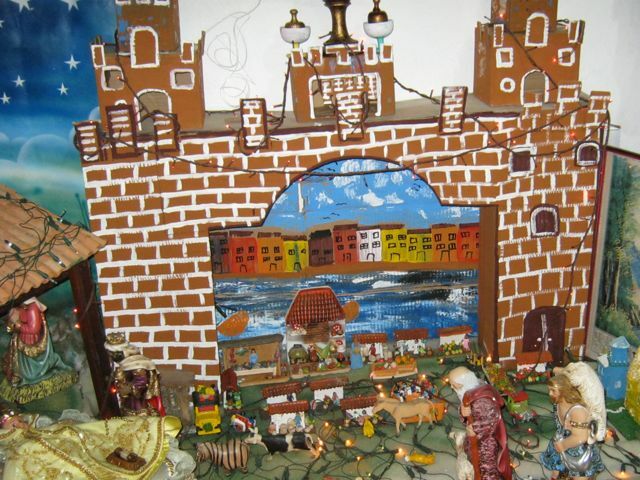 Today he told us about Paso de Niño, a custom that occurs near Christmas. It’s one of the first times we’ve known about a traditional custom beforehand so that we can anticipate it rather than be surprised by it. (The other time I can think of is when Isabel told us about the Christmas traditions she celebrates with her family, in which we’ve been invited to take part this year.) 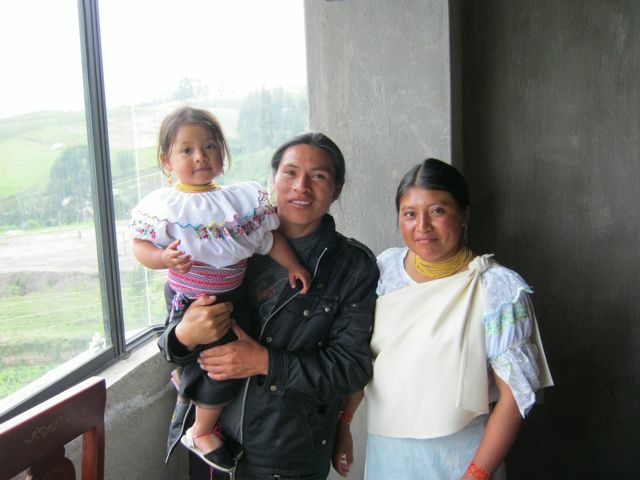 We’ve also learned that Pablo has a girlfriend in Cuenca, while he lives in Quito. We took Elvia, Rosa, and Margoth to Ibarra. I wasn’t going to go but got to thinking that we may not have a chance to take these three delightful people on excursiónes forever. So I left my second spouse (aka, computer) and went along. Elvia has been cooking here for four or five months. She has three sons, one of whom is in the university. Margoth and Rosa have been here since we arrived in February and have been good friends with each other the entire time. They mainly clean the rooms and do laundry. When Elvia does not have to cook much, she also helps clean and do the laundry. And when groups are here, especially large groups, they all pitch in and do whatever needs to be done. Thus, Elvia has become close friends with the other two. I can’t help but think of them as las tres amigas. 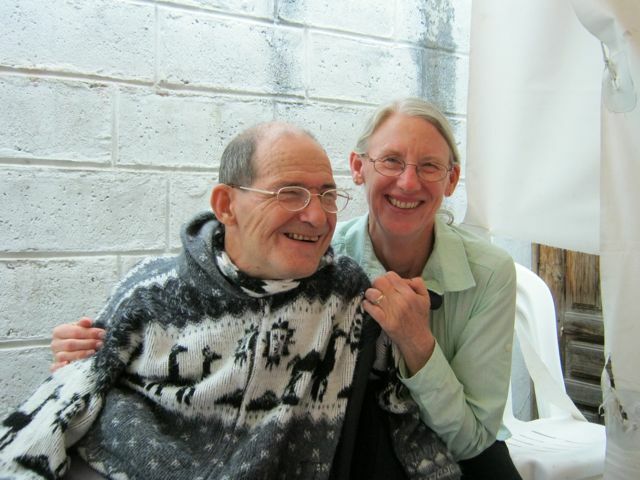 Before we really got started on the outing, Margoth and Rosa asked to stop at a bank in downtown Otavalo. There was no parking, so we let them out and drove around the block a few times. We stopped in the street at the meeting spot a couple of times and waited until someone came up behind us and forced us to move. I guess that’s called double parking. There’s not much need for that in Texas. I love Rosa’s laugh. It’s deep, and bubbles up easily when she’s having fun. She’s also married and has three children. Her husband is physically disabled, but can work with his hands. I know Rosa’s life is tough. That makes her infectious laughter all the more beautiful to hear. The first stop they asked to make was the mall in Ibarra. Elvia had a camera (I don’t know if it was new or not), so she took a bunch of pictures. The funniest ones were when we were in the toy stores holding different toys. No one bought anything. This was strictly window-shopping. The mall stores were too expensive. Margoth has turned seventeen since we’ve been here. That means she was holding down a full-time job at the hotel since before she was sixteen and a half. She is very intelligent, very pretty, and very spirited. She’s always up for an adventure. I wonder how life will change her. I certainly hope she always remains spirited and eager to learn. After the mall, we went to the Arcangel statue above Ibarra. I stayed in the car because I’d been there a few times before. The tres amigas had never been there. They and Marilyn had a great time walking around the site and exploring the surrounding area. Instead of going back the way we’d come, Marilyn spotted an alternative road and decided to explore. It was cobblestone and led through a very pretty area, ending at Lago Yahuarcocha, which we skirted for a while. Marilyn and I decided that road would be worth taking again. Of course, we went to Rosalie Suarez on the way back. Margoth, Rosa, and Elvia really liked that. I don’t think they had ever been there, either. If you’ve been following our blog, you are no doubt aware that having helados at Rosalie Suarez in Ibarra has quickly become one of our favorite treats. We get helado (ice cream) in the hotel sometimes, but it’s store-bought. Not nearly as good. At Rosalie Suarez, it’s hand made, creamy smooth without being heavy, and made with fresh fruit. On the way home, there was a lot of fog until we got near Cotacachi, making driving a little stressful. We first took Rosa to her home in Quiroga. Her husband and a son came to the door to welcome her when we drove up. 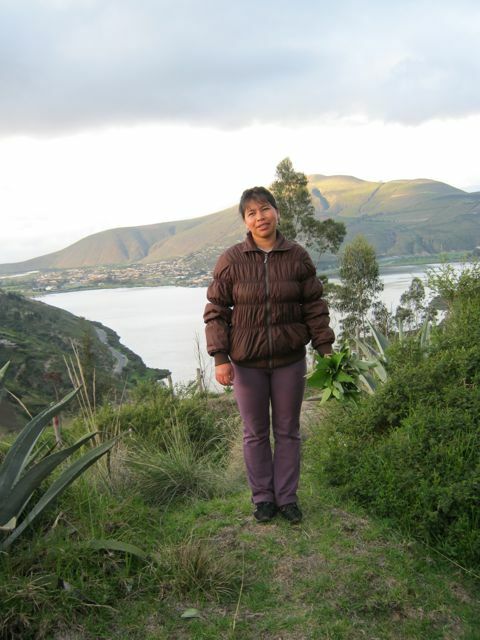 We then took Elvia to her home in Otavalo. 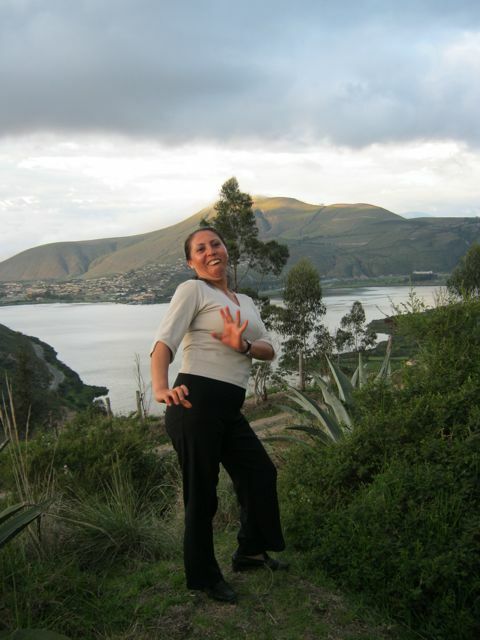 Last, of course, we took Margoth to her home, high above Otavalo. It’s a poor section, but many of the houses there have spectacular views. I wonder how many can enjoy those views. When we came back from our visit to the U.S. on November 21st, the tres amigas, as well as other people, made us feel so welcome. The tres amigas went one step further. They gave us a box of chocolates with a very sweet note welcoming us back. We really like the tres amigas. Could it be that we have joined the group and it’s now los cinco amigos? Today I got a haircut. It’s pretty easy to cut my hair since I’m almost bald on top. I just tell the person cutting my hair that I want a #2 around the sides and a #1 on top. But then comes the trimming. That’s a bit scary to me, at least down here in Ecuador. In the States, barbers always, always, use clippers to trim my hair. The last time I can remember a straight razor being used on me was when I was an adolescent just beginning to shave. I quickly went from a straight razor to a safety razor. I still got a lot of nicks and cuts so, before too long, I ended up using an electric shaver. Admittedly, there’s something delicious about feeling, and actually hearing, a straight razor mowing down hairs at skin level, be it the whiskers on my face or the unwanted hairs on my neck and around my ears. But an electric razor or electric clippers just work a whole lot better for me, considering the fact that I can move involuntarily at any time. Perversely, if you tell me to be still, I’m likely to jerk more. Go figure. Here in Ecuador, all the barbers use straight razors to trim the hairline during haircuts. The straight razors are kept in sterilizers, but I’m not sure how good the sterilizers are, so I sometimes think about the possibility of contracting HIV/AIDS if I get nicked. It’s not a huge worry, because I don’t think the disease is very prevalent here. But it does cross my mind. Another source of comfort is that I understand people who contract the disease now can live 15, 20, 25 years with the new treatments that are available. I’m almost 62. Fifteen more years would put me right about at my expected lifespan. I’ve already had a wonderful life. If I make it to my expected lifespan, that’s icing on the cake. I don’t view that attitude as fatalistic or pessimistic. I’m just weighing risks, as we all do each day. The last time I had my hair cut, I went to a new barber. The previous barber had cut me while using a straight razor. She said that I jerked, which is highly possible, but I don’t remember it. I certainly jerked when I felt her cut me! However, that’s not the only reason I decided to change barbers, or barberos. The former peluquería (beauty shop) I was going to was crowded and dingy, if not a little dirty. I went to a barbero near the house of some friends because it was open and airy and clean. The shop (or tienda) is run by a woman and one assistant. The woman’s daughter, probably six years old, hangs out there when she’s not in school. The assistant cut my hair while Marilyn talked with the daughter. When it came time to trim my hair after most of it was cut, she got the straight razor out of the sterilizer. I’d been waiting for this moment. After my experience with the last barbero, I was ready to pass up a trim and told her I didn’t need it. Marilyn heard me and talked me into getting the trim anyway. The barbero was very careful and did a good job. When I went back today, she was just as careful. I’m getting over my phobia of straight razors. I’ve also learned a trick to lessen the chance of involuntary movements. If I get my haircut in the afternoon or evening, I’m more tired and less likely to jerk. Oh, the price of today’s haircut? It was $2.50. I gave her a 20% tip (propina), though tips are not often given here. Aren’t I magnanimous? Actually, the first figure to cross my mind was a $2.50 tip. I had to remind myself that she was charging what the economy here will support. Just because I can afford to pay more may not be a good reason for actually doing so. Besides, foreigners usually pay higher prices here because the locals know that foreigners are rich compared to natives in at least nine cases out of ten. It evens out. Today at breakfast we meet someone from the Latin American Council of Churches. He is here to conduct a workshop for regional ministers on the environment. Usually, the people we meet here don’t speak English, but this man does. It’s nice talking to him before we are interrupted and he has to get back to his business here. He’s from Pennsylvania, and has master’s degrees in psychology and theology. He has been living in Quito with his family for four years. An interesting thing is that, to us, he speaks Spanish fluently. But he says that his children, four and eight years old, often make fun of his Spanish. That may be interesting, but it’s also disheartening to us. It’s like Jeannie, our Spanish immersion teacher in Cuernavaca, once told us: no matter how good we get at Spanish, there will always be things that we don’t “get” simply because we grew up in an English-speaking environment. In the afternoon, Marilyn talks me into an “excursión”. We are just going to drop off payment to the man who did the inspection on the house we want to buy. I am going against my better judgment. It’s the rainy season here. In the eight or nine days since we’ve been back from our visit to the States, it’s rained each afternoon, sometimes extremely hard. I’m pretty certain it’ll do so again today, but I go anyhow. At the house, Marilyn goes in while I wait in the car. She’s in there a pretty good while, mainly because the wife of the architect who did the inspection for us cannot find the bad check Marilyn wrote. The check is not bad due to insufficient funds. It’s bad because Marilyn wrote “treita” instead of “treinta” (thirty). The banks are very particular here. One has to write the amount out exactly. Also, when writing numbers, we have to remember that periods and commas have reverse functions. Whereas we would write something like $2,010.99, it’s $2.010,99 here. We pay in cash this time. I don’t mind waiting in the car. It gives me a chance to watch “street life”. The street is paved. (Actually, it is adoquinado, a sort of cement tile.) Paved or not, I see a woman herding four or five head of cattle down the street. She’s headed to the end of the street, where it becomes dirt and opens into a pasture of sorts. We’re at the edge of town, but I’ve witnessed similar scenes even near downtown Otavalo. The woman is likely herding her cattle from one patch of grass to another. The patch she came from could have been a vacant lot, the median of a street, or even a park. The grass is not high in many spots around and in Otavalo, yet I seldom see lawnmowers. Livestock usually keep the grass short. Even at the hotel where we live, horses often graze in the backyard. Here come four or five little children walking past the car. When we first arrived in Ecuador, I always found it an odd sight to see young children on the streets with no adults in sight. I’m used to most children, especially young children, being driven around or not allowed to stray from their home property in the United States. Here, it seems, children still have the freedom to be children, at least until they start working at a young age to help support the family. Two small girls have a 5 to 6 foot length of hose. They are riding it as if they are riding a hobby horse that has no head. 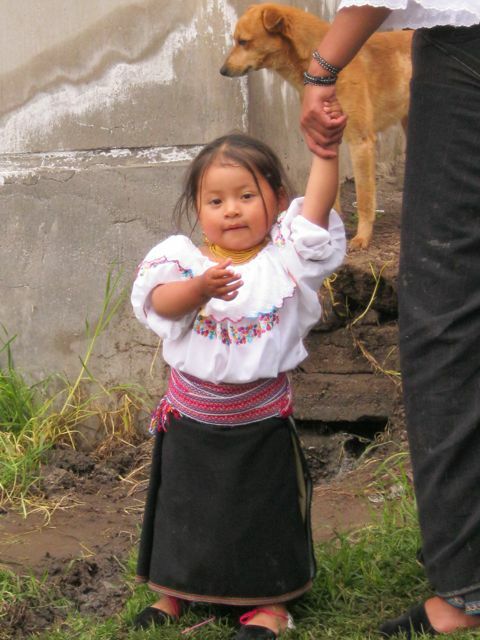 They look to be 3 and 4 years old, but looks can be deceiving, especially amongst the indigenous people in the Andes. I’m fairly used to their short stature by now, but I can still mistake people for being much younger than they actually are. The two little girls go off into the cornfield next to the nicely built house that Marilyn is visiting. Now, two little boys are walking on the sidewalk towards the car and me. I notice the older little boy has a slight limp. Observing more closely, I see that one hand is a little drawn in to itself. Ah, though a different form, he probably has cerebral palsy, like me. I briefly wonder if he gets any physical or occupational therapy. As they pass by, the younger boy, like little boys all over, can’t help but drag his hand along the silver side of Molly, our car. I smile, thankful there was nothing in that hand. The door to the perimeter wall of the nice house opens and Marilyn steps through it, followed by a young woman carrying a young girl. The young woman is the wife of the architect we hired to inspect the house we think we’re going to buy. Marilyn wants to introduce her to me and opens my car door. Mirabel is a little surprised when I speak to her in Spanish and says that I’m muy inteligente. I don’t mind that. I ask, ”¿Como sé llama?” (What is your name?) to the little girl and Mirabel responds, ”Salomé”. Now, that’s a pretty name. “¿Ella tiene dos años?” (Is she two years old?) I ask Mirabel and she looks pleased when she replies, “Dos y media.” We talk awhile longer, and Mirabel reminds Marilyn she’s welcome to come get some cuttings from her garden after we move into the house. Marilyn has told me that they have a really nice garden. We’re off to the bienes raices, or real estate agency. Not five blocks from Mirabel’s house, it starts to rain. It’s raining harder at the bienes raices, so I stay in the car again. Marilyn goes in and is back out in a few minutes. The papers we need for the first step of the house purchase will be ready at 5:00 p.m. tomorrow. That’s what we needed to find out. We head back to the hotel. When we arrive, the rain is really coming down. My instincts about the weather proved correct this time. It’s coming down too hard to get out of the car without getting soaked, so we sit and talk for a while. Then Marilyn remembers she needs to text the lawyer and tell him when the papers will be ready. Her doing so reminds me that I’d like to check the signal strength of the cell phone both at the hotel and at the house. The reason I want to do this is that we get our internet connection from the cellular network. However, by the time Marilyn finishes her text, the rain lets up and it’s wise to make a run for it. I knew we’d get wet if I went with Marilyn this afternoon. 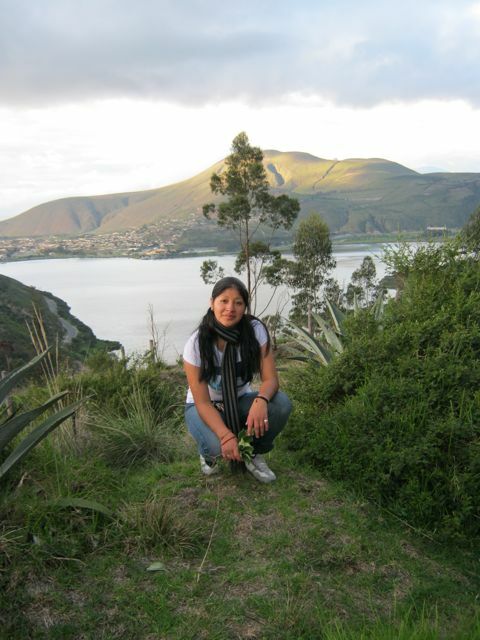 But then, the excursion inspired me to describe some of the common sights I see in Otavalo and Ecuador. Not a bad trade-off. A nationwide census is being taken today. The last one conducted in Ecuador was in 1999. An "Immobility Law" is in effect. Everyone in all cities in the country are required to stay in their residences from 7:00 a.m. to 5:00 p.m. so they can be counted in the census. All businesses, churches, restaurants are closed. Some hotels have minimal operations. All buses, taxis, even national airlines are not running between the census hours. If one’s international flight arrives after 7:00 a.m., these persons must remain in the airport until 5:00 p.m. If one’s international flight leaves before 5:00 p.m., these persons must arrive at the airport before 7:00 a.m.
We knew this in advance. We have prepared with any food we might need, any things required for carrying out the activities we have planned for the day. For us, it is an enforced day of rest; something that in past times was a usual, weekly occurrence in Christian and Jewish regions of the world and maybe in other faith traditions as well. A day of rest; a day of quiet; a day scaled down in busyness.... In Ecuador, people work 5½ to 7 days a week. It is a welcome day for many of them, I can guess: A day when households are together. A day when children, adults, and seniors living under one roof can spend time with each other. A Holy Day. An unexpected free day often throws me into confusion. Of course, the unexpected day often is accompanied by lack of electricity or very bad weather. Today we do have electricity, there is no rain this morning, but probably we will have rain this afternoon as is normal for this time of year. I am ready with my list of things I would like to accomplish: prepare lesson plans for the second level of my adolescents’ English class; e-mail some friends I’ve not written for awhile; do some funding research for FEDICE. The difference from a regular day is that my soul feels calm; there is no traffic noise; the birds were twittering this morning; I woke refreshed after a good night’s sleep. It feels like a Holy Day. This morning, Glenn and I turned the news off for a while and did some talking. The sun has been trying to peek through the clouds. Breakfast was scaled down as the regular cook is off. We’ve been told there will be a 1:00 p.m. meal for the rest of the day. Life seems simple. Glenn plans to watch some football. I took a nice walk before 7:00 a.m. so feel peaceful. Maybe there is a reason God has requested we all take a weekly day for thanksgiving, a day for rest, a Holy Day. The morning feels eerie as we look up calle Bolivar, a main street of Otavalo that we can see from the hotel where we currently live. The traffic signals are cycling green-yellow-red, green-yellow-red as they’re designed to do when the electricity works, but that is the only sign of movement, or life. 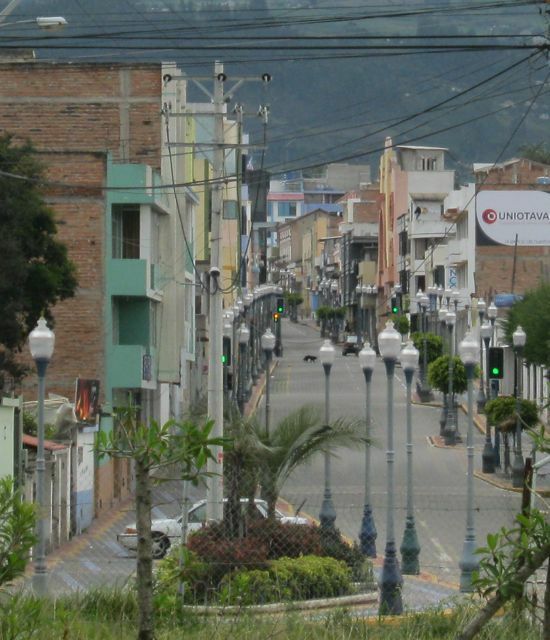 Normally, calle Bolivar bustles with activity – seven days a week. We can hear the bark of a far-off dog, the twittering of birds, but the constant drone of traffic is absent. It reminds me of a Department 56 model town, sans figures of men, women, and children. Marilyn thinks it looks like a movie set about the day after a nuclear bomb has been detonated. We know a nuclear bomb hasn’t been exploded, however, because the animals can be heard saying just that. Though strange, the morning is peaceful. Like mornings should be. What we are witnessing is no model, and no aftermath of some strange bomb. The Ecuadorian census is being taken today. The last one conducted in Ecuador was in 1999. An "Immobility Law" is in effect. Everyone located in urban areas in Ecuador has to stay in their homes or hotels from 7:00 a.m. to 5:00 p.m. in order to take part. If anyone needs to travel today, they have to do so before 7:00 a.m. or after 5:00 p.m. International travelers arriving after 7:00 a.m. have to stay at the airport at which they arrive until after 5:00 p.m. If their flights leave before 5:00 p.m., passengers have to be at the airports before 7:00 a.m. There are no domestic flights between the designated hours. Travel restrictions do not apply outside of urban areas, however. People in rural areas will be counted at a later date. Here, at the Ally Micuy Hacienda, Paulina helps us fill out the census form in our room. We can probably muddle through it ourselves, but it’s great to have help. It is cold this morning, so we turn on our space heater and direct its welcome warmth toward her. “¡Buena idea!” she says. She notes that my middle name is Paul, similar to her name. That tidbit must be pleasing to her. Before she came to our room, Paulina also helped a group of Spanish mountain climbers who are confined here for the day fill out their forms. Everyone else here is helped by colegio (high school or pre-university) students when filling out their forms. In the U.S., we hire census workers to do the counting. Here, they use colegio students. Marilyn and I don’t know if they are paid but, if they are, we can guess it’s not much. Since there are no outside workers here, Don Jairo and family, who live and work here, cook for us. Don Jairo Vaca is manager of the Ally Micuy Hacienda. The “Don” in Don Jairo is his title. Don Jairo is a good cook and owns a restaurante downtown. He is also highly skilled at a barbacoa (barbecue) pit. We all eat at 1:00 p.m., instead of whenever we feel like it during the hours of 12:00 p.m. and 3:00 p.m. There are five different types of meat, including three types of sausage, plus salad and cooked vegetables. I tell Don Jairo, “Me gusta cuando usted barbecoa.” (I like when you barbecue.) We all set up to eat outside. Just before the food is served, however, thunder begins booming and we are forced to go into the comedor (dining room). We sort of get back to normal before 5:00 p.m., the end time of our “house arrest”. Marilyn begins teaching preparations for the upcoming week, while I watch fútbol americano the rest of the afternoon. We invite the group from Spain to watch but, not surprisingly, they have no interés (interest). We may have missed the U.S. Thanksgiving holiday, but this day has pretty much made up for it. Businesses were closed, making it feel like a holiday; we had great food; and I got to watch my football. Sharing the day with family is the only thing that would have made it better. I recently read that the recession in the U.S. officially ended in June 2009. That’s nice. My investments have come up a bit, I’m still able to volunteer here in Ecuador without an expectation of some payment; Glenn and I are eating; and we still have comfortable accommodations in the Ally Micuy Hacienda. All seems well and as it should be for us. Except...about a month ago, after being here for 6 months, I began to feel deprived. Maybe the recession is just starting for us? All over the United States, people have been living through deprivation for several years and here it feels like it is just beginning for us. The food here is good, but it tends to be the same without a whole lot of variety that has led to my experiencing “scarcity.” I have never eaten the same thing for breakfast every morning for any length of time in my entire life. But here, every morning I have the same rolls with jam, an oatmeal beverage (my attempt to eat a whole grain), and a fresh juice that is most often tree tomato. At times, I long for homemade coffee cake with a streusel topping or buttermilk pancakes with homemade applesauce or a hot cereal. I long for some variety. Many times, we don’t bother to go to dinner. We already ate some sort of slab of meat (like chicken or beef) at lunch and another of the same just isn’t appealing. The vegetable in the evening is usually the same as at lunch, a combination of peas, carrots, onions, and broccoli. The scarcity of variety is unappealing enough to encourage us to pass up the third meal of the day. Recently, our friend, Isabel, invited us over for dinner and also invited me to make a dessert in her kitchen. I decided to make cookies that have a touch of peanut butter and cinnamon. So I went to our local Akí (akin to a very small Sam’s) to get what I needed. There was no peanut butter! Otavalo does not have peanut butter! I suppose this is nice for anyone concerned about food allergies and I can guess there aren’t too many kids here that are allergic to peanuts since they are not exposed to them. Surely this is a blessing. But how can a town of 50,000 people in Ecuador not have peanut butter? (mmmm, Maybe they don’t grow peanuts here...). After asking around, I discovered that it does exist in Ecuador, but our local Akí is too small to carry it. I now know I can get it in Ibarra (a 20 minute drive) or Cayambe (a 45 minute drive). Glenn has been a real trooper. It was my idea to come to Ecuador and he came to support me and to experience the adventure. He has not been disappointed and has really enjoyed his time here. That is, he’s had a good time until about a month ago when, after searching for different ways to view his beloved fútbol americano, he came to the conclusion that the best way was to get DirecTV. Streaming on the internet was too costly and the connection too slow. The local bars all play fútbol (soccer) games. He was actually watching X’s and O’s with arrows on the web and reading what had happened into the night, he missed seeing the games so much. So due to this deprivation, we now have DirecTV and the NFL Sunday Ticket. Glenn can keep up with his favorite teams this fall. Well, I guess this was only a lack for about a month. This all came with a clear picture on the TV screen AND news in English. I wonder if I’ve been a little homesick. When I heard and saw football for the first time since February, I suddenly craved Tostitos and salsa with sour cream. And I don’t really even care about football. Life continues on. But it seems, if we have patience and perseverance, we can get what we really need, a sense of accomplishment. My fall classes have been very enjoyable. My pre-school children at Caluquí are learning, speaking, and understanding more words and I continue to be greeted with “Gud moorning, teecher” or “Gud moorning, Maryleen” and everyone says “Gudbye” at the end of class. I sometimes have trouble leaving as I walk through the playground to the gate because the children like to grab my legs. Lucila, one of the teachers, says the children really like me. The new classes in Cachimuel are going well, too. The average attendance is 10 children for the adolescent class with the participants being eager to learn and enjoying the various activities. I love how they smile and laugh as they gain confidence in their English speaking abilities. The adult class averages around 5 students. Those who come are slowly learning useful phrases and sentences like greetings and numbers and getting-to-know-you questions and answers. Cachimuel is a very welcoming place. And my three adult students here at the hotel that meet about once a week enjoy laughing at each other’s attempts at the English language as they make progress with useful phrases and sentences. When they come to clean our room, they often have questions of what something is called in English. Maybe here in Ecuador, we are experiencing a recession of a different type: A slight deprivation of getting to have everything we think we want. Maybe the food is a little less varied; maybe we can’t hop in the car and always drive somewhere to get what we think we need; maybe our favorite TV shows are not all available. The positive feedback we receive from what we’re doing though, fills my heart. Oh yeah, in a moment of seeming hunger this afternoon, I went to the Akí for something crunchy and salty, and you know what? I came back with a bag of Tostitos. Today Marilyn is out shopping for clothes for our ahijada (goddaughter). Yes, we've decided to become padrinos (godparents) to the 2-year-old daughter of one of the pre-school teachers where Marilyn volunteers. That means, among other things, that we get to buy clothes for her bautismo, or baptism, as well as a gift. Natasha is adorable. She even likes me. Her bautismo will be on Dec. 12th. We were asked to accept this honor about a month ago. We didn’t know exactly what responsibilities this might entail, so we made an appointment to visit the house of Lucila and Elias Otavalo one afternoon to discuss their request. The weather was pleasant when we arrived in Caluquí. We found a two-story house with living quarters on the second floor, with no space for entertaining guests downstairs. Elias wasn’t home yet. We knew perfectly well that Marilyn and Lucila couldn’t haul me up the stairs by themselves. So we suggested bringing some chairs downstairs and meeting there. Lucila wouldn’t hear of it. Soon, Elias came home. With Elias, a rather slight man, lifting the back of my chair and Marilyn and Lucila lifting the front of my chair, they managed to get me to the second floor. It wasn’t easy. Besides having to lift me, they had to negotiate a very narrow staircase. The turn in the stairs was nearly impossible, necessitating the need to tilt my wheelchair sideways to get around it. It was a somewhat hairy ride, but this old adventurer can take it. Once on the second floor, we were shown around the modest living room. The first thing I noticed was their picture window view of Volcán Imbabura, my favorite volcano. I really liked it when they rolled me right up to the window to get a good view. I told them that they could just put my worktable at that window and leave me there. We were pretty high up the slopes of Fuya Fuya, so the view was spectacular. I live for views. And that’s when I saw two-year-old Natasha. She had been sleeping, so she was pretty shy and probably a little bewildered to have these strange people in her house, but she was soooooooo cute! We talked and drank tea for a long time. 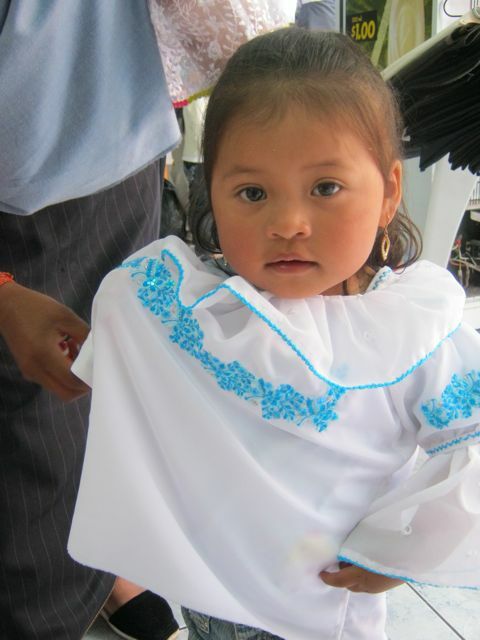 As mentioned before, Lucila is one of the teachers in the pre-school program in Caluquí. Elias grows strawberries near Otavalo. He told us the growing characteristics of tree tomatoes, babaco, avocado trees, etc. in this part of the country. Elias is also an assistant pastor at Tocagón. The way he described things (there are five assistant pastors), we might call him a deacon. It was very interesting. During the afternoon, a thunderstorm rolled in. And it was a doozy. In our eight months in Ecuador, we had never witnessed a storm so violent. We were pretty high on the mountain, so we felt like we were in the thunderclouds themselves. Before the mists closed in, we could see the lightning strike the valley below. The strikes seemed to originate at about our level. That was a little spooky. Then the lights went out. Lucila and Elias made sure all electrical appliances were turned off in case there was a power surge when the electricity came back on. Then we resumed our conversation. We kept waiting for them to bring up the subject of Natasha’s bautismo (baptism), but they never did. Maybe Marilyn had misunderstood and this was simply a “getting-to-know-you” session. It looked like we weren’t going to discuss the responsibilities and expectations of being padrinos after all. It was getting late in the afternoon. The storm had passed, so we started to say our goodbyes. That was when Elias and Lucila finally brought up the subject of Natasha’s bautismo. They explained that, besides keeping in touch with Natasha through the coming years, we would be expected to purchase Natasha’s ropa de bautismo (baptism clothes) if Marilyn agreed to be madrina and I agreed to be padrino. We would also be responsible for purchasing two chickens for the ceremony. (It'll be interesting to see exactly what they do with those chickens.) Also, we were asked to buy a cake for the reception at their home afterward. All of this sounded doable. Thus, we agreed to become padrinos. Marilyn, Lucila, and Natasha are back from their shopping excursion. I am admiring what they purchased, and I know Natasha will be a little doll at her bautismo. Of course, she’s precious now. We’re at lunch now and Natasha is behaving well. She’s more interested in playing with her little bracelet than eating lunch, I think. Sometimes, when she’s allowed to walk around, she plays with my wheelchair. She’s just the cutest little thing! Do I sound like a proud padrino?